Transparent super heavy-duty PVC Tote bag that lasts a lifetime? A see-through easy travel bag, cosmetic storage tote bag, office workers bag and student lunch bag? NFL or PGA and other security policy clear tote bag? Generously sized spacious and multiple compartments with durable zippers? 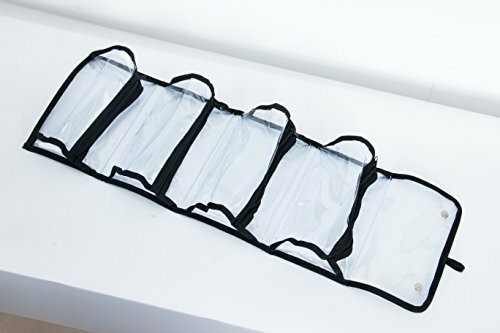 Waterproof and easy to maintain clear cosmetic bag? Our brand of transparent tote bag is made of super heavy-duty PVC of 0.5mm thick for transparency, durability; Ergonomically designed for all travel enthusiast, home, cosmetic storage, office, school, airport and stadium mandate; durable strap for carriage and a sturdy secure rotary hook for hanging anywhere such as airplane lavatory door, behind door, wall, closet rod; Spacious with 4 equal sized compartments (26.77” Length x 13.77” Width / 70cm x 35cm) to safely hold all your travel essentials according to your needs with 4 row zippers of high quality for durability; See-through for convenient spotting and sorting out your cosmetics while meeting standards of institutional security mandate like NFL and PGA and other security gate-way pass, ideal for students needing clear lunch bag, office workers, sports. Water-repellent and easy to clean in the event of accidental cosmetic spillage!